Wild in the City » Blog Archive » What a view! 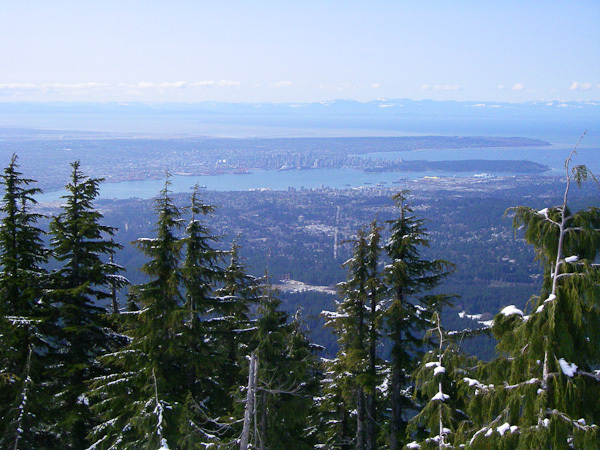 We snowshoed for about an hour from Mount Seymour to get to this viewpoint, from which you can see Stanley Park (the big patch of green mostly surrounded by water on the top right of the photo) and Vancouver (the big mass of buildings just left of Stanley Park). We had a blast on this wonderful sunny day and I was quite proud of myself for managing to carry about 30 pounds on my back for the 2.7 km it took to get there. Luckily, on the way back, Zak carried DS in his backpack and I took the light load. We were out much later than we expected, but thank’s to Julie’s cookies, DS was kept happy. And strangely, he didn’t fall asleep on the way home. He went to bed late but had a good nap, and he has been back to his old self ever since. No more whining (well, I wouldn’t say no more, but at least it has been reduced to normal proportions), and he has even started laughing again. Seeing the difference in his behaviour makes us realize he really must have been sick last week! 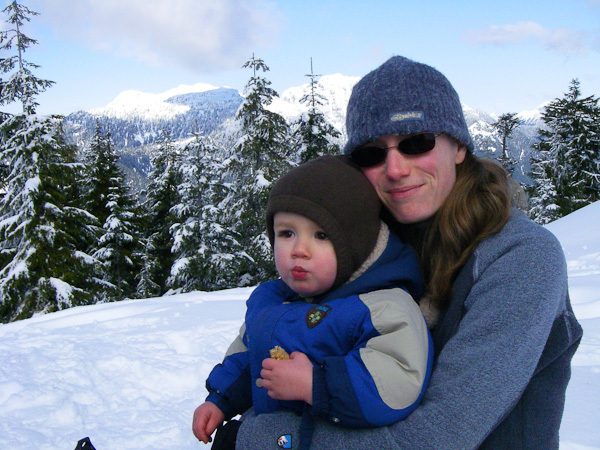 This entry was posted on Wednesday, April 1st, 2009 at 8:52 am	and is filed under Family life, Outdoors. You can follow any responses to this entry through the RSS 2.0 feed. Both comments and pings are currently closed.